Swipe right to quickly copy any clipping to back to your clipboard. Swipe left for more options. Select multiple clippings and perform copy, merge, add to list or delete operations. 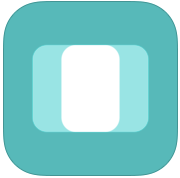 Input saved text or links directly into any app using the Copied keyboard. • Copied supports text, links and images (JPEG, PNG, BMP, GIF, TIFF). • Batch Copy multiple clippings back to your clipboard. • Quickly search and find something you’ve saved. • Swipe right to quickly copy a clipping back to the clipboard. • 3D Touch Application shortcuts and Peek and Pop on iPhone 6s and iPhone 6s Plus. • Multitask using the Split View and Slide Over on compatible iPads. If you pay a one-time in-app purchase upgrade, you can organize your clippings in lists, sync everything on iCloud, and update your clipboard from another device. • iCloud Sync gives you access every clipping and list on all of your OS X* and iOS devices. • Clipboard Sync provides seamlessly copy on one device and paste right away on another device. • Use lists to store and organize your clippings in any order you like. Here’s an App Store link for Copied. Compatible with iOS 8.0 or later, Copied for iOS is an universal app that works with iPhone, iPad and iPod Touch. 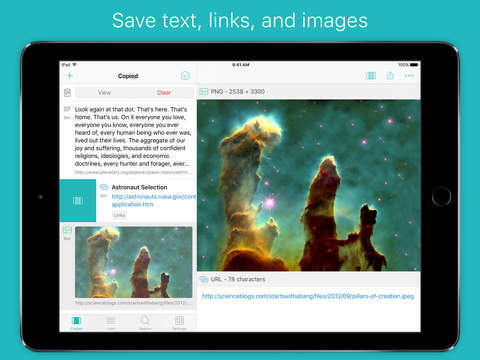 It is a free app, and for $1.99 you can upgrade to Copied+ and take advantage of cloud synch across all your devices.